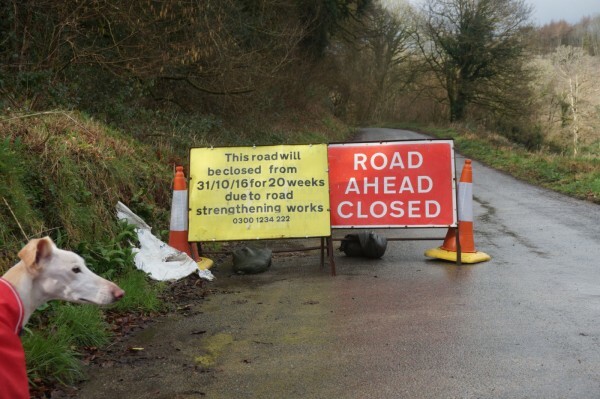 Although while I was wandering past, the postman came past in his van, so I deduce this may be not so much a complete 20-week road closure, so much as that fine Westcountry tradition, the road sign aimed at People Not Us. We, the people who live here and are prepared to take a gamble on a small risk of having to reverse for half a mile through the mud, may pass. Although this isn't going to my village, so this sign actually IS aimed at me, since I am, in this particular context, Not Us. So should that be "this road will reopen dreckly"? Although I'm also tempted by story ideas about an intrepid trans-dimensional postman who can whizz past all obstacles, although possibly with many adventures en route, probably enough to fill a multi-book contract. And his cat. They might as well have put 'dreckly' on the sign, really! This reminds me of the 'Road Closed' signs on the road from which my street turns; in practice it was open almost all the time, if you were willing to drive slowly and know that traffic was single file and at odd angles. Rosie seems dubious of the sign. Around here we get signs that say ROAD LEGALLY CLOSED, USE AT OWN RISK which seems like about the same thing.